Koa is a very friendly dog. Likes to be around his people. Good with other dogs but tends to be the dominant one. Koa is not your typical high energy husky. He is happy just hanging out and with short 1 to 2 mile walks. He is NOT a hiking/running/agility dog. Has a clean bill of health. Koa would be suited to a low activity level home. Koa will chew on things if left alone so a dog run is a must while being unsupervised. Kennel and crate trained. A 4 1/2 foot fence is fine with a locking latch...he is smart enough to watch and figure out how to open a latch. Rides well in a car traveling long distances through mountain roads. Koa never really felt like our dog. We purchased him and brought him home at 6 wks old. As the year went by, Koa always seemed to be a dog we were just raising for someone else. He's a good boy! Sweet! We are an active family with two other very high energy husky mixes. Koa just never seemed to fit with us. 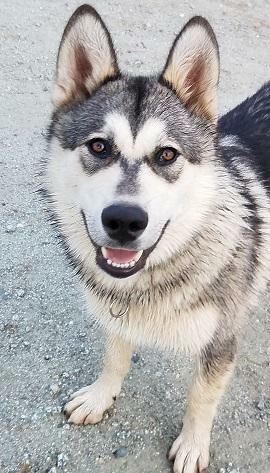 If you are looking for a husky mix with a lower activity level please consider making Koa part of your family. Thank you for taking the time to look. God bless you indeed! He is a neutered Male, 1 years 7 months old, Housetrained, Crate Trained, good with Children, good with Small Children, good with Large Dogs, good with Small Dogs, has Rabies vaccinations, has DHLPP vaccinations, on Heartworm preventative.